For my first review, I must choose Napoli Pizzeria. It's a downtown Sydney landmark. Established over 50 years ago, in 1962, by Frank and Grace Dellorusso, when they moved to Sydney from Italy. The business is now run by their children at the original Charlotte Street location, and they have recently opened a second location in Sydney River. 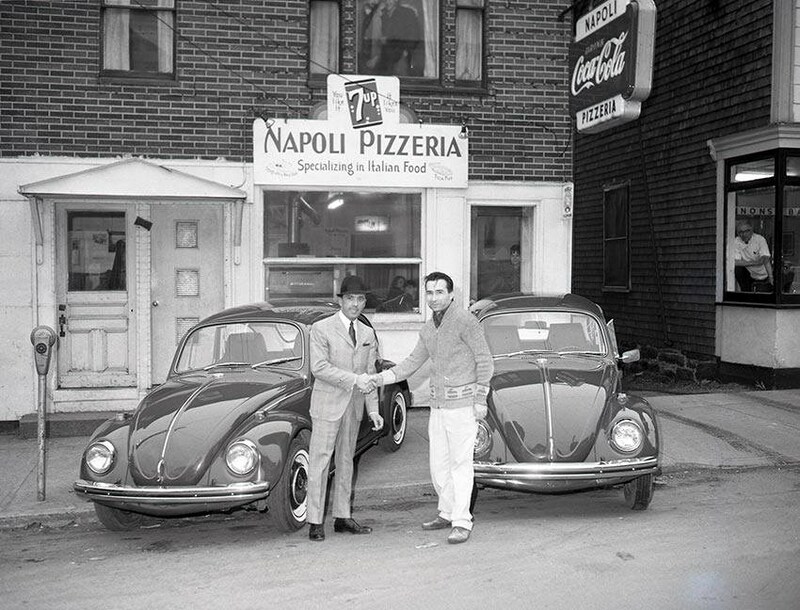 Photo of the original Napoli Pizzeria. That's Frank Dellorusso on the right. I know many Cape Bretoners that visit home and make a point of going directly to Napoli for their first meal. I've heard many people say that it is the best pizza in Canada. Pizza preference can trigger a rigorous debate, so I won't go there, but I will say that Napoli certainly deserves to be in the Good Food Review! This is a local success story of an immigrant Italian family making good in Cape Breton, and one I can personally relate to as my family also immigrated from Europe some years after the Dellorusso family to run a restaurant just down the street from theirs, so we became friends. I recall going to the Paramount and Vogue Theaters in the 70s to watch matinees with my sister (King Kong, Star Wars, Pippi Longstocking, Herbie The Love Bug, you know ... the classics :-) and then, on the way home, picking up a small combination pizza using a crisp $2 bill. No doubt, many Cape Bretoners have similar memories. The place is clean. No clutter. No mess. It's always been that way from what I can remember. They have always used the best ingredients and the food is seasoned and cooked well. The pepperoni tastes right (not like cheaper salami-like pepperoni) and tastes even better when it is slightly burnt. And, the mozzarella cheese is good quality. YUM NOTE: Less expensive mozzarella cheese can be overly greasy when heated. I do remember Grace Dellorusso once lamenting that even the better quality mozzarella cheese that is available these days is not as good as it used to be in the old days. The tomato sauce is seasoned well and is somewhat muted so that it properly complements the ingredients. YUM NOTE: Sauce that is too heavy on the basil (or oregano, depending on the recipe) can overpower the taste ... and sauce that is heated for too long can trigger a taste of burnt basil. The pizza crust is very good and Napoli strikes a good balance between thin crust and thick crust pizza. Again, the flavour of the dough complements the tastes around it. YUM NOTE: Personally, I love thin-crust pizza and I really dislike thick, doughy pizza. When the dough is too thick or saucy, it doesn't cook well. When I order pizza from Napoli, I ask for it to be "well done" which gives the dough a crisper texture and enhances the flavour (you don't want to overcook the pizza though, because it will burn the cheese - more on this below). In fact, when Napoli first starting using the conveyor-belt oven, they still had their original pizza oven and, for those in the know, you could ask for your pizza to be made in the "top oven" to give it that original flavour. Bottom line ... there is love in the food at Napoli Pizzeria! Pizza ... duh! But, not just any pizza. Combination pizza (pepperoni, mushroom, green pepper) with bacon, pineapple, NO CHEESE, and WELL DONE. Yup, no cheese. I can and do eat cheese - no dietary issues, but you have to try this pizza ... it tastes great and doesn't leave you with that heavy feeling that cheese pizza often does. WARNING: A no-cheese pizza only tastes good if the dough, sauce, and other ingredients are well balanced, like they are at Napoli. This would not work with many pizza eateries. YUM TIP: I do not normally like raw or cooked pineapple at any other time ... only on pizza, because the dried sweetness of the pineapple perfectly balances the saltiness of the bacon and pepperoni. Pineapple is not just for Hawaiian pizzas! CREDIT: My sister was the first to order a no-cheese pizza in my family (25 years ago from Napoli) and I thought she was crazy ... until I tried it. You may also know that authentic Italian pizzas are not coated with cheese but often have small clumps of fresh cheese on top. Manicotti ... my second favourite meal at Napoli ... these are large pasta tubes filled with Ricotta cheese and topped with tomato sauce. Tastes great. A big meal for one or a small meal for two. I'll close with my favourite YUM TIP for reheating cold pizza. I like my pizza hot, but reheating in the microwave makes it soggy, and the oven changes the taste too much. The best method I have discovered (so far) is reheating in a frying pan on the stove, covered. This method toasts the bottom crust while reheating the toppings (but be careful not to burn it). So, what do you think? 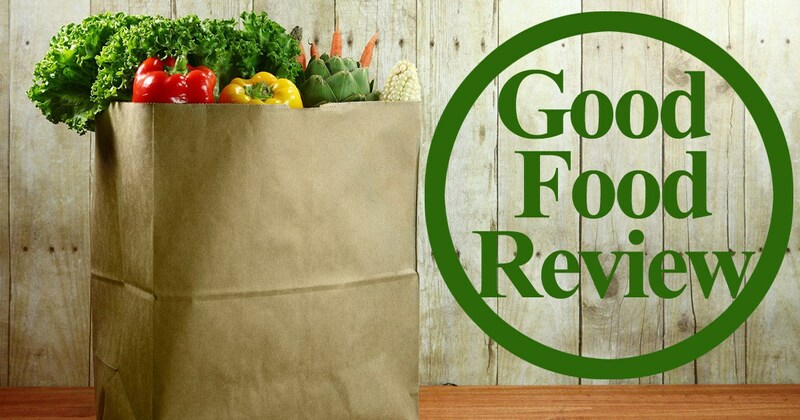 Share your positive food experience below ... or post your own review of a local eatery - here's how. Posted by Mathew Georghiou on goCapeBreton.com where you can find and share everything about your local community. Share your good food experiences at local eateries. Yeah for no cheese pizza!